San Diego quite possibly has the best climate in the country. Sunny and warm most days, it is the ideal city for outdoor living. In recent years, people in San Diego have begun to expand their living space outdoors and often are using stamped concrete to do so. Stamped concrete can give you a high-end look with a reasonable price tag. So essentially you're saving money without sacrificing style. Check out any of San Diego's tourist attractions such as Sea World, Legoland and more and you'll likely find you're walking on stamped concrete. 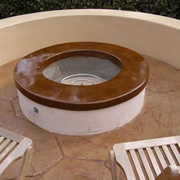 Here is a list of concrete contractors in San Diego. San Diego is a diverse city with many different styles of architecture that reflect its population. From modern to Craftsman, there are homes of every type in this coastal metropolis. Luckily, stamped concrete can be customized to suit the style of your home. A European fan stamp will give you an old-world look, while an Arizona flagstone pattern is perfect for a more rustic setting. For a more modern look a seamless texture skin can be used in conjunction with decorative saw cuts as in the photo at left. Not to mention there is nearly a limitless array of colors to choose from, so that you can easily coordinate with the exterior color scheme of your home. Also known for its relaxed surfer culture, San Diego is all about fun in the sun. Stamped concrete will hold up well in the coastal environment with very little maintenance, leaving you more time for surfing or strolling through the Gaslamp Quarter with friends. A quick application of a UV-blocking sealer every few years will keep your stamped concrete looking its best for years to come. 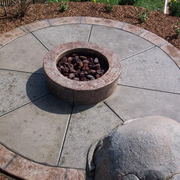 Wouldn't it be great to come home to a stamped patio like this one complete with a fire pit? 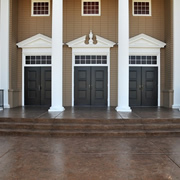 The pattern used was sandstone and the color was a combination of a pecan tan base with brown antique release applied when the pattern was stamped into the concrete. Stamped concrete is also a great choice if you own a business in San Diego. It will impress your clients, while being easy on your wallet. Depending on the complexity of the design, stamped concrete can cost anywhere between $8 and $18 per square foot. For a basic pattern like the seamless texture skin in one color show at left, you can expect to pay an amount on the lower end of the range. If you are concerned about getting the best deal, have three different contractors provide bids and pick the one you are most comfortable with. However, keep in mind that in recent years, some contractors have become volume focused rather than quality focused in order to make enough money. It's best to look for an installer that offers a unique and different look that you know you will be happy with.